Discovered by the LaSagra observatory in southern Spain, the asteroid 2012 DA14 will pass within about 3.5 Earth radii of the Earth's surface on February 15, 2013. An asteroid half the size of a football field will give Earth the ultimate close shave this month, passing closer than many satellites when it whizzes by, but it won't hit the planet, NASA scientists say. The asteroid 2012 DA14 will fly by Earth on Feb. 15 and zip within 17,200 miles (27, 680 kilometers) of the planet during the cosmic close encounter. The asteroid will approach much closer to Earth than the moon, and well inside the paths of navigation and communications satellites. "This is a record-setting close approach," Don Yeomans, the head of NASA's asteroid-tracking program, said in a statement. "Since regular sky surveys began in the 1990s, we've never seen an object this big get so close to Earth." "2012 DA14 will definitely not hit Earth. The orbit of the asteroid is known well enough to rule out an impact," Yeomans, who heads the Near-Earth Object Program at NASA's Jet Propulsion Laboratory in Pasadena, Calif. He added that the odds it will slam into a satellite are "extremely remote." A fairly typical asteroid like 2012 DA14 — which measures 150 feet (45 meters) across — zips by Earth about every 40 years, but only strikes every 1,200 years, Yeomans estimated, and the impact of such an object would not be catastrophic over a wide area. Asteroid 2012 DA14 is about the same size of the object that exploded in the atmosphere above Siberia in 1908, leveling hundreds of square miles in what scientists now call the "Tunguska Event," NASA officials explained. Yeomans said an asteroid similar in size to 2012 DA14 slammed into Earth 50,000 years ago to create the famed Meteor Crater in Arizona. But the Meteor Crater asteroid was made of iron, which made its impact especially strong. This NASA graphic shows the size of asteroid 2012 DA14 as it compares to a NASA space shuttle. The asteroid is about 164 feet (50 meters) across. 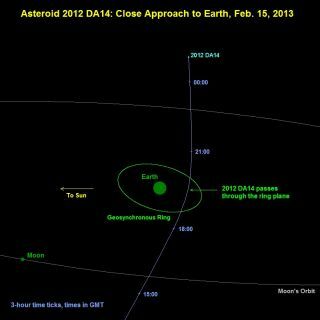 When asteroid 2012 DA14 zooms by Earth, NASA scientists will be tracking the space rock closely. The space agency plans to use its Goldstone radar in California's Mojave Desert to follow the asteroid from Feb. 16 to Feb. 20. The observation campaign should help astronomers build a 3D map asteroid 2012 DA14, as well as refine estimates on the space rock's shape, spin and reflectivity, NASA officials said. Since the object will be moving across the sky so fast, only the most experienced amateur astronomers are likely to catch its close pass. But it could be a challenge. "The asteroid will be racing across the sky, moving almost a full degree (or twice the width of a full moon) every minute," Yeomans said. "That's going to be hard to track."